A major medical tech company is using the center in a video showcasing excellence in care. The Comprehensive Stroke Center team and Medtronic representatives pictured alongside the replicator. Having chosen the Comprehensive Stroke Center as an example of excellence for a video about treatment and patient care for stroke victims, Medtronic, a global leader in medical technology, has reached out to Dr. Michel Mawad, dean of LAU’s Gilbert and Rose-Marie Chagoury School of Medicine and the driving force behind the creation of the center. The company’s Senior Director of Neurovascular for Europe and the Middle East Dan Raffi called the Comprehensive Stroke Center “one of the most advanced” in the world, highlighting the School of Medicine’s international leadership in the field. Opened in March 2018 under the auspices of the School of Medicine, the center is housed at the LAU Medical Center-Rizk Hospital in Beirut. Qualifying Medtronic’s choice, Raffi cited the center’s partnership with the Lebanese army to hasten the transportation of stroke victims when every second counts; the importance placed on training and education to increase success rates; and its track record of excellence, set within months since its opening. He also noted its world-class technologies – such as RAPID imaging software and a replicator, which allows students to receive pre-clinical training in a simulated environment – as well as its multidisciplinary medical team, on call around the clock to ensure continuity of care. “Putting together the human element is crucial for establishing and maintaining a comprehensive stroke center,” acknowledged Dr. Mawad. Collaboration between health providers and medical technology, services, and solutions companies, like Medtronic, is essential to addressing healthcare needs and achieving best patient outcomes. 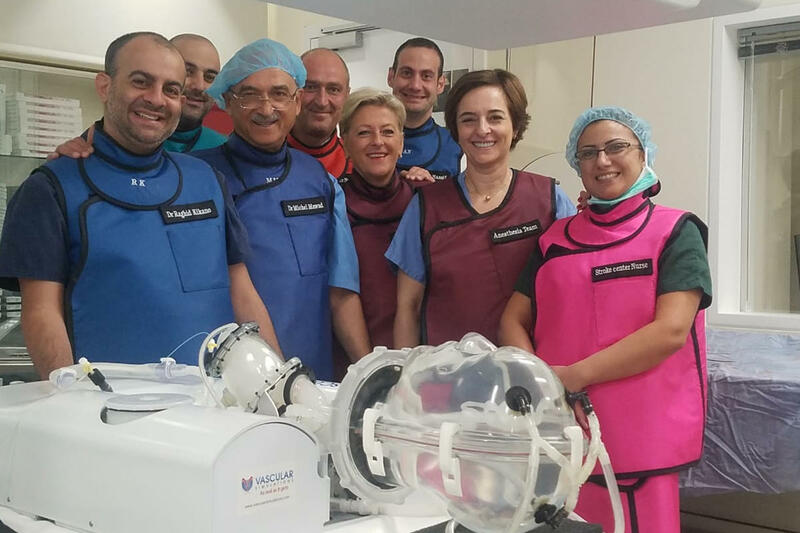 For this reason, LAU’s School of Medicine had partnered with Medtronic, in order “to create a first-class, state-of-the-art training center for all physicians in Lebanon and neighboring countries in the MENA region,” said Dr. Mawad. “What we are doing sets the example of a cooperation between a center of excellence for medical care and education, and multinational medical companies,” concluded Dr. Mawad.